She’s used her talent with fabric and design to help my cousin create ethical jewellery which they both run as Savannah Chic.That’s not her only passion. She loves reading, not so much fiction books but books on philosophy and Epics retold. I think her choice of mysteries and other fiction would be the ones written in Gujarati. She’s a fantastic cook and I’ve learnt how to bake and make different salads from her.She has taught me not to be afraid to try out any new dish. She can whip up dishes in a jiffy and I must say she kept dishing out food from my kitchen from breakfast to dinner during Nami’s wedding. She’s what I like to call her ‘our travelling pantry.’ She goes to London to visit family and she’ll have taken some food item for the whole family and rest assured its not a small family. That will include not only her side of the family and her immediate family but all my cousins and aunts and basically half of Edgware and Harrow! When she came to Bangalore for the wedding, her suitcase was like a treasure trove. I just sat there in awe at all that she had brought from Nairobi and London. When I asked my family to be guests on my blog, my kaki immediately complied. She excitedly told me about the gluten free pizza crust that she bakes. So over to her. Thank you kaki for taking the time from your hectic schedule to measure the ingredients (I know you hate doing that!) and for the photos of your preparation. Reminiscing about Mayuri and myself: the kitchen was our preferred rendezvous. 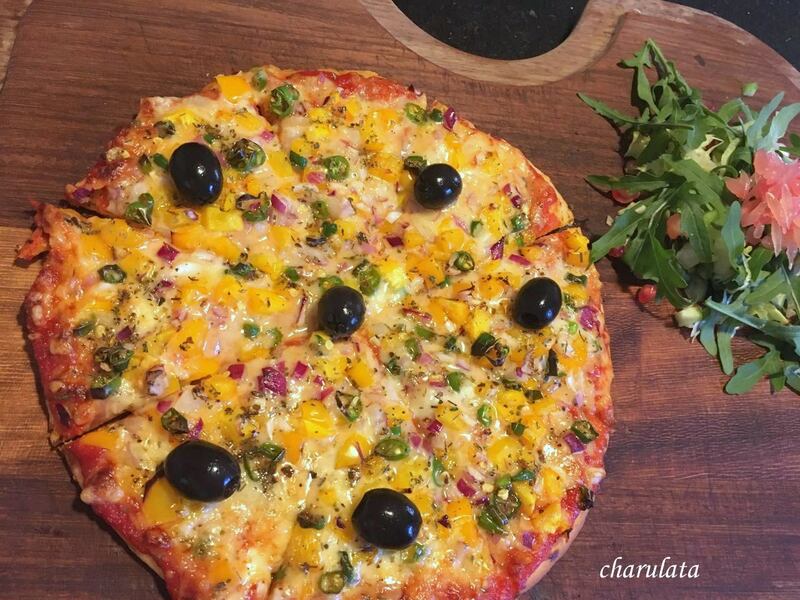 What is permanently etched in my memory is the Saturday afternoon some forty years back when we decided to make Pizza for nine people armed with Tarla Dalal’s first recipe book. We started with rice flour …and what ensued is not a matter of discussion here (!). These sort of disasters brought Mayuri and myself closer. Oh and by the way, Mayuri is my niece through marriage and a good seven years younger to me. It is her mum from whom I learnt my basic cooking skills. Today, my daughters think highly of my cooking but prefer to follow Mayuri’s Jikoni. And why not? I too call upon her now and then for cooking tips. Though Mayuri and myself started cooking almost at the same time she took it many many notches up and has become a fine chef. Our family is proud of her. If I were to describe Mayuri in one sentence it will be something like: ‘she thinks, speaks, and acts the same’ and this, in my opinion, is a beautiful and rare quality. Put the flour with salt and yeast in a bowl. Mix it. Using little milk at a time form a dough. It should not be too hard or too soft. Knead into a smooth dough. Shape it into a ball. Grease the bowl with little oil. Rub a bit of oil over the dough. Put the dough into the greased bowl and cover it. Let it rise till its double the size. Using extra flour, roll the dough out into a 8-9″ circle about ¼” thick. Put the base on a greased baking tray.Let it rest for 10-15 minutes. Bake it for 5-7 minutes. Take it out of the oven and after it cools a bit cover it up with a muslin cloth till required. To prepare the pizza, put your own choice of toppings and bake for 5-8 minutes or till the edges of the crust turn light golden colour and the cheese has melted. Ready made farali or farari flour is available in most Indian stores. Farali flour is usually a mixture of amaranth(rajgira), little millet (samai), tapioca pearls(sabudana), water chestnut (singara) and sometimes buckwheat flour and is gluten free. I know its readily available in Mumbai. You could try buying it online Jolly. This gluten free pizza is tempting.what is this farali flour,I have not used it before. Hello Sadhna the ready made flour is readily available in most Indian stores especially if owned by Gujaratis. We use the flour to make rotis, puris during fasting and Ekadashi. That's why its called farali flour. Hiw thoughtful of your Kaki to measure all the ingredients! Finally I have a new recipe idea for the farali flour lying around at home. Ur kaki sure is very creative and talented!